Fortunes were being dreamed of. And made! The Dutch wanted in. The Spanish and the Portuguese had been sailing to Japan for 50 years, spreading their mix of trade and religion. Mostly religion. The Dutch, hating the Spanish for occupying their country and trying to kill all non-Catholics, wanted nothing to do with spreading any religion anywhere. The Dutch wanted spices, especially black pepper, believed to prevent plague. They outfitted five ships, mounted with cannons, to fight off pirates. The ships’ holds were filled with woolen textiles, eyeglasses, glass beads, muskets and ammunition. 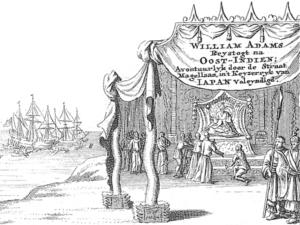 They set sail out of Rotterdam on June 27, 1598; the 520 or so sailors had been told the voyage was the regular Dutch trade run – east around the tip of Africa and on to India. They had been lied to. They would cross the Atlantic Ocean. Go through the Straits of Magellan. Cross the Pacific. No Dutch ship had ever sailed to Japan. The voyage was an unending disaster of storms and disease. One ship turned around in the Atlantic and made it back to the Netherlands after two years and 16 days at sea, with 36 of her original crew of 105. The other ships fared much worse. Two were captured and most of their crew killed. One went down near Japan with all hands on board. In April, 1600, the last ship, the Liefde, rotting away, made it to a harbor in western Japan; 20 crewmen were still alive. Only a half dozen could even stand up. Few survived, but one who did, English pilot Will Adams, became the confident of the Japanese warlord, Tokugawa. (He never made it home, living out the rest of his life in Japan.) Tokugawa used the cannon and the weapons from the Liefde to win the great Battle of Sekigahara, October 21, 1600, that made him Shogun. Awesome story! Sure makes me glad I was not a Dutch sailor in 1598!